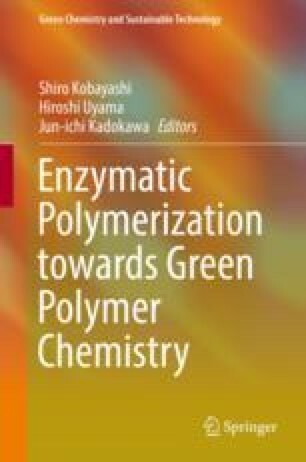 This chapter reviews enzymatic lipase-catalyzed ring-opening polymerizations (ROPs) to polyesters. A variety of cyclic esters are subjected to lipase- catalyzed ROP. Lipase catalysis shows unique polymerization behaviors of lactones with different ring sizes. ROP mechanism of lactones by lipase catalyst is mentioned, which applies to preparation of terminal functional polyesters. Lipase catalysis induces enantio-, regio-, and chemoselective ROPs, which can hardly be achieved by conventional chemical catalysts. ROP of cyclic esters in a variety of media is mentioned for green synthesis of polyesters. ROP of lactones is combined with living radical polymerizations, yielding designed block copolymers. ROP of other cyclic monomers, mainly cyclic carbonate, is also mentioned in this chapter.